For our fans in the United States, we’ve joined up with Barnes & Noble Booksellers and Make: Magazine to host Raspberry Jams at a handful of select Barnes & Noble stores on Saturday November 7th at 2pm. It’s all a part of the Barnes & Noble Mini Maker Faire, which runs at all B&N stores November 6th through 8th. We’ve recruited community members within the United States to host Jams at the key locations listed below, but if you’d like to join in at a different store that’s closer to you, don’t hesitate to contact your store’s Community Relations Manager to let them know you’d like to participate. While you’re there, keep an eye out for The MagPi on the newsstand! 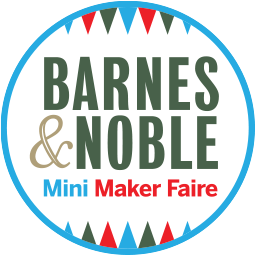 You can find more details about The Barnes & Noble Mini Maker Faire here. Barnes and Noble has already given me a table at the 7620 Rivers Avenue North Charleston, SC 29406 Location and my dad and I will have some Raspberry Pi projects there. Is there anything we can do to help? Hey Gavin! Thanks, so glad to hear it! Send me an email at [email protected] this domain, I would love to hear more. Matt…are you planning to be in Emeryville? Anything I can bring that will help? I am very excited to be a part of this event. Make sure to stop by if you live in Houston to see my talk! I’ll be ready to serve all comers, having met with Robbie, the Community Relations Manager at the Brentwood, TN, location, where I’ll be all day Saturday, November 7th, with a presentation on the Pii, peripherals, and accessories starting at 2 PM on that date. I’ll also be at the Murfreesboro and Hendersonville locations after 4 PM on Friday, November 6th, and all day Sunday, November 8th (I’ll know which location on which day in a few days as they don’t have a manager at the level of Robbie since they’re much smaller). Thanks to Matt, Eben, Liz, and the rest of the Foundation for inviting me to participate in this great opportunity to expand the Pi’s presence in the central Midwest region. Many have heard of the Pi here, but never laid eyes on one, let alone gotten to play with it. Since the Jams I run with W.H. Heydt at the Computer History Museum in Silicon Valley have distributor status with Adafruit, Pimoroni, MCM Electronics, Newark, and Allied, among others, we’ll also be able to offer special packages and deals to Mini Maker Faire and Jam attendees in Music City Nashville and the surrounding region. Of course, Minnesota gets overlooked, as usual–despite being the home of 3M, Digi-Key, and scores of other tech companies. We have millions of engineers and geeks… bring us some love! 1. Find a venue – your local B&N store – check! 2. Determine a good day and time to hold it – the Foundation has coordinated that – check! 3. Promote, promote, promote – B&N and the Foundation have performed the kickoff, but local Pi users have to carry the ball over the goal line – check! 4. Encourage everyone in the area to bring their Pii, peripherals, accessories, projects, etc., and have them tell what they’re doing – especially kids – check? I could not have said it better myself! Thanks, Jim! I will be contacting the Community Relations Manager tomorrow (Monday) at the Barnes & Noble store located at 591 South University Dr. Plantation, FL 33324, 954-723-0489 to make arrangements to represent Raspberry Pi. Last minute change. I have a willing and exciting invite to setup Raspberry Pi table at the Barnes & Noble located in Pembroke Pines, FL for the reminder of today (Saturday) and all day Sunday. I will be onsite for the 5:00 pm & 7:00 pm Meet The Makers time slots. Exciting time was had by all today at Barnes & Noble located at 11820 Pines Blvd. in Pembroke Pines, FL. I arrived at about 4PM to setup demonstration table with a model B v1 (256Mb), a model B (512 Mb), & a model 2B loaded with the latest version of Jessie. I also had an SD card with the latest version of OSMC which I would swap with Jessie on the model 2B. From the moment I powered up Jessie I had no less than 6 young and intelligent minds ranging in age from 6 to 14 hovering over my table asking questions about mods, mobs, HTML5, CSS6, python, Java script, Scratch, and much more for nearly 3 hours! I have been invited back by the very enthusiastic people who are running this Barnes & Noble location for another session beginning at 11:00am till as long as I can stand it, or until closing…which ever comes first?. I hope other locations are experiencing the WOW & Wonder I experienced during today’s event. I am looking forward to a full day tomorrow. I hope to be better prepared with more of my home project on the table. I would love attend these JAM event if it is around Dallas, TX. Is there a plan to have one around DFW area? I am sure there is huge community of geeks around here. Glad to hear that there’s a huge community of geeks in Dallas! If you’d like to participate and help organize a Jam that day, please contact your local B&N’s Community Relations Manager. Contact me via email if you do go forward with it: matt at this domain. Ready for 2pm @ Woodmere B&N! Thanks again Matt! Putting posters @ work and telling all my friends! Really excited about it. Matt, If you need help at Emeryville, CA location I’d be happy to volunteer and do what I can. I’m pretty handy with the basics of Pi set-up and OS install, ssh, vnc, etc. Great, the nearest location is only 100 miles away. Perhaps some additional locations someday? Hello, the Clark NJ B&N store is also looking for some cool makers to demo their Raspberry Pi experience at their store as well. They are looking for something cool to demo it to the kids. For more information, you may click on the web site or ask for Pete or Wayne at 732-574-1818 (store number). The words that come to mind are Exuberant Enthusiasm. Not only are the people at the Barnes & Noble in Pembroke Pines excited and involved with helping young minds learn and getting involved in the local schools, the young minds I found at the Raspberry Pi table today were the same as yesterday’s with plenty of WOW and Wonder… especially with those who did not know what a Raspberry Pi was before the event. The Community Relations Manager, Melinda, and her co-workers were all very much involved and excited there was a Raspberry Pi presence at their location. It is with Melinda’s help that I hope to organize a local Raspberry Pi user-group. Issue #37 of The MagPi, the official Raspberry Pi magazine, is out now!